Police commander Jana Matinova and her country Slovakia are both struggling with the demons of a Communist past while dealing with modern criminal gangs who prey on the vulnerable. Jana Matinova joined the Czechoslovakian police force as a young woman, and now she serves justice in the new state of Slovakia. Unusually for crime fiction she has a sympathetic, friendly boss Trokan, but this is balanced by an incompetent subordinate Seges, and an unfortunate estranged daughter Katya. 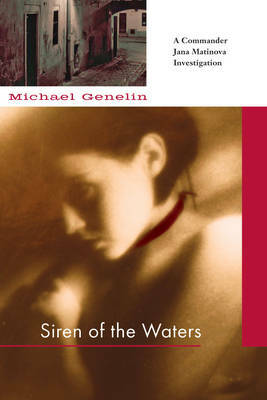 SIREN OF THE WATERS follows Jana's investigation into the deaths in a car crash, of a minder, and six women identified as prostitutes. Slovakia is bordered by five countries, Ukraine, Poland, Hungary, the Czech Republic and Austria, and is a conduit into the heart of Europe for the flesh peddlers who earn vast amounts from their obscene trade in misery. Jana is asked to attend a conference in Strasbourg and speak before the committee on human trafficking. But first she travels to Kiev and learns about the bitter rivalries between the various Russian mobs and hears about the mysterious criminal mastermind known as Koba. In Strasbourg Jana meets her son-in-law Jeremy, an FBI agent, and Levitin, a Russian policeman looking for his beautiful young sister. Then Foch, the UN representative to the human trafficking committee is murdered. Hoping to solve the case and see her granddaughter Jana moves on to Nice where a ferocious battle ensues as elements of the Russian mob settle scores in the search for a beautiful young woman who holds their secrets. In a devastating denouement following a Russian-exile Grand Imperial Ball, Jana eventually meets both her granddaughter and criminal mastermind Koba. Blended in to this "matryoshka doll" like thriller is the back-story of Jana as a policewoman in the Communist Czechoslovakian police force, her relationship with her husband Dano, a leading actor in the country, and his self-destructive crusade against the regime that destroys their marriage. These events explain Jana's tragic estrangement from Katya. I will admit that I found the main story a little difficult to follow with the complex double-dealing, and red herrings, but then confusion was the aim of the criminal protagonists. The most enjoyable part of the book for me was the drama of the back-story of Jana and Dano and the sad tale of how totalitarian regimes treat those who will not conform to their will, tearing families apart and ruining lives in the process. Author Michael Genelin knows the corrupt world he writes about and the book is full of sharply drawn characters, and meticulous research. He is a writer, lawyer and international consultant on government reform, as well as a former Deputy District Attorney of Los Angeles County. He lived in Slovakia for three years working as an adviser to the government, judiciary and police force and drafting anti-corruption legislation. He has written a second book in the Jana Matinova series called DARK DREAMS.